Active Components: Linalool, coumarins, borneol, and bergapten. Conventionally, angelica is applied as a regulatory substance for female hormonal balance. Although some herbalists state that the herb is potent of producing an effect the hormones commonly produce on the organism, or contains phytoestrogen, they are mistaken. The majority of its positive actions felt during premenstrual period depends on its ability to soothe spasms, especially those occurring in the smooth muscles. History: According to some myths, angelica was shown to people by an angel, who came in a dream to save them from bubonic plague. In Chinese medicine the plant has been widely applied to cure several types of female reproductive system disorders. Conventional Chinese medicine lists dong quai as female ginseng. The plant is commonly prescribed for treating high-bloody menses, insufficient menses, menstrual spasms and pains, and womb bleeding. Conventionally angelica has been applied for eliminating the common symptom of premenopause, hot flushes. The plant is also applied as an aid for cardiovascular system, to treat elevated arterial tension and boost blood circulation. Used For: There are several cases in which the plant is applied. They are digestive system disorders, respiratory system diseases, especially coughs, meteorizm, low appetite and body weakness. It is usually applied as part of therapy for menopausal syndrome, PMS, and fibrocystic breast illness. 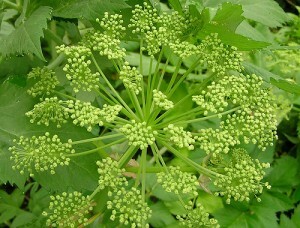 Angelica is believed to produce a generally positive effect on female reproductive system. It boosts blood circulation, controls menstrual bleeding, reduces hot flushes and uterine spasms of PMS, and generally helps females to overcome menopause. Pregnant women should avoid taking it. Different parts of the root produce different effect. The upper part acts as a blood renewal remedy. The tails are applied to eliminate blood clots and boost blood circulation in severe cases and to throw the afterbirth out in case it doesn’t throw out itself. Coumarins, found in the root, are applied to treat edema, and lymphatic gland inflammations. Additionally it’s applied to cure psoriasis. Additional Info: Angelica has a long lifespan and is native to Lapland, the UK, and Iceland. Conventionally, the plant has been referred to as a cure-all, and was thought to be a remedy for any infections. In China angelica occupies the second place according to effectiveness, the first one is given to ginseng. The herb grows in damply areas, and watered regions. Its height commonly comprises 5 feet on average. The plant blossoms in summer and, following the flowers, oblong fruits with yellow-colored seeds appear. Preparation and Intake: When prepared for used the root is powdered and packed into tablets, capsules, tinctures, and produced as tea. 3-4 grams as a daily dose is commonly sufficient for most cases. In case of serious complications take 2 capsules thrice a day. If the case is mild, decrease the dose gradually. According to Chinese homeopathists, fruits should be avoided while using dong-quai, or eaten in minor quantities. Abstain from herbal teas, like ginseng root tea, for 2-3 hours after using angelica extract. To eliminate any side effects possible, combine with vegetables or ginger. Safety: Angelica is very reliable with regard to its safety for the organism. It may only make people with sensitive skin vulnerable to direct sunlight. If taking the remedy for a long period, you should carefully time your exposure to sunlight or ultraviolet rays of any type. Angelica is not suggested for use during breastfeeding period or pregnancy.